Step up and show support for our combat soldiers who have bravely defended our country, sacrificed their own life and limbs, and fought for freedom so that others may live in peace. 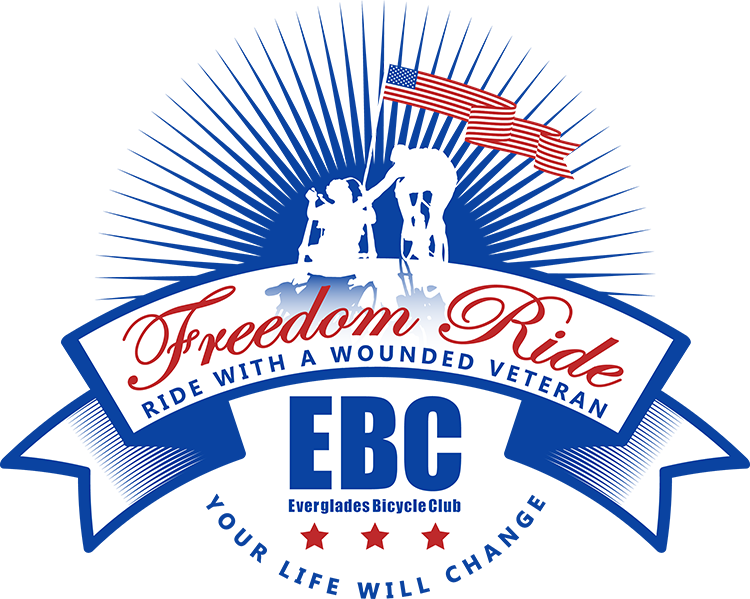 The Everglades Bicycle Club is once again honoring our heroes in FREEDOM RIDE 2019 benefiting the Achilles International FREEDOM TEAM OF WOUNDED VETERANS. Many of our wounded military veterans who have suffered severe injuries and conditions, from amputations to paralysis to PTSD, will be riding alongside able-bodied cyclists from all over the world on handcycles and other adaptive bicycles for up to 100 miles! Shorter distances will be available but all routes will head to or turn around in Key Largo. The view from atop the Card Sound Road Bridge is incredible. There is nothing like this ride: Wounded Vets and Cycling Buddies will share stories along the way and the bonds will last forever. We do not exaggerate when we say that this ride will Change Your Life. All the net proceeds from the Freedom Ride will go towards purchasing handcycles and adaptive bicycles for wounded veterans who choose to become part of mainstream cycling events and rides. All the proceeds stay here in South Florida, helping our local vets.